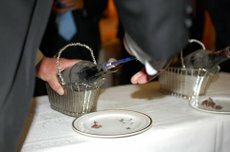 On the 18th, a reception to welcome Dr. Arthur Carty, former Science & Technology advisor to the cabinet and his Nanotech team of about 6 people was held at the Embassy of Canada. We all enjoyed a very lively time. His Excellency Ambassador Fried, who was appointed to the Ambassador to Japan last September was also present so I had the honor to talk to him on various topics, such as the "Young Woman Scientists Exchange Program" between Japan and Canada, which I started 5 years ago as President of the Science Council of Japan to commemorate the 75th anniversary of diplomatic relations between the two countries. It was a great opportunity to meet old friends and get acquainted with new people. 19th was a dinner at the Embassy of France with Dr. Nathalie KOSCIUSKO-MORIZET, Minister of Forward Planning, Assessment of Public Policies and Development of the Digital Economy. So I was involved in conversation of mixed languages of English and French for two days, but unfortunately, I don’t speak French at all. Photo1: From right, Minister Kosciusko-Morizet, His Excellency the Ambassador Philippe Faure, myself, Minister of French Embassy Dr Jean-Louis Armand, in charge of science and technology. By the way, the photographer of these photos has a good taste, don’t you think? His blog is great, too. The Minister has her blog ( 1 , 2 ) to dispatch information, comments, etc. which is very impressive. She commented on us in the blog also. This day, there was also a reception for the gathering held in honor of Dr. Gozo Sato. I will report to you in detail soon in a separate posting, but Dr. Sato is a physician who has contributed tremendously in the history of the Modern Medical Education of Japan and Korea. The meeting was planned to learn about his works and to think on how to extend his will to the future generation of the two countries. I had the honor to greet all participants. I look forward to coming days. 150 years ago, Japan was at the beginning of the Meiji Restoration (1867) – a time of great change. It was the time when diplomatic relations with Britain and France were officially established as well as the foundation of Keio University. 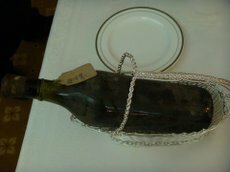 Last year, a variety of events commemorating the 150th anniversary took place. One more important historical event – publication of "The origin of species" by Darwin was also 150 years ago. 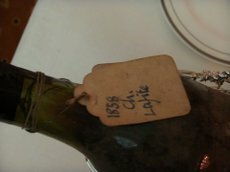 I had the great honor and privilege to taste 2 bottles of Chateau Lafite of 1858 (I heard that it was a vintage year, and also a decade before it was owned by Baron Rothschild), that very year of 150 years ago. It was on January 24th, a day before my departure to London. About 20 people or so gathered, but let’s not discuss about who was there. You might be held a grudge against such an experience even if you were just invited and have nothing to do with it. 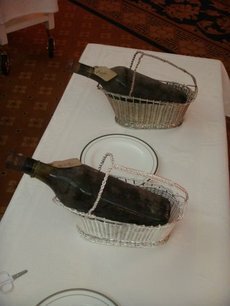 All I know is that they were found in Gibraltar, and somehow someone succeeded in purchasing them (For your reference, I will introduce you a link to an antique wine company). 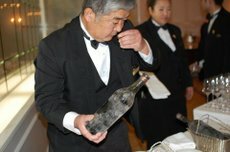 We enjoyed listening to Mr.Kogai, President of Japan Sommelier Association (photo8) explaining about the wines during the one hour interval of opening two bottles but I assume that this was an unprecedented experience even for him to encounter such a wine. 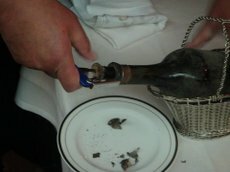 Although the 2 bottles were the same wine, they tasted quite differently. The rest of the wines we tasted that evening are as in the list below (photo10). Dinner was a French course with vegetables from Kyoto. 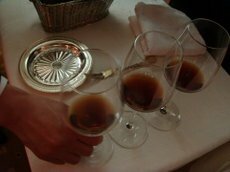 As digestive, Chateau d’Yquem 1975 was served. My goodness, it was the ultimate luxury, thank you so much. This happened only 3 weeks ago, but seems like a long time, still like in a dream. On 11th, I went to Paris by the usual Air France last flight departing at 21:55. I have been on this flight so many times for these 3-4 years. You are able to work full day before going to Narita so it is convenient for flying to Europe. London, for instance, it may even be possible to make it for a morning meeting if connection is good because you will arrive by 9:30 or so. I arrived at Rome via Paris at 9:00 on 12th. The hotel was elegant St. Regis Hotel I joined with Mr. Banno who arrived from New York and together we prepared for the next day’s “Global Health Forum”. This Forum is held under the auspices of our Health Policy Institute and Aspen Institute Italia . Other institutions such as Rockefeller Foundation, etc. are also giving support. We are trying for the first time to reflect the process of "Global Health Summit; Toward TICAD, G8 and Beyond" (which we have organized last year) to the G8 Summit which will take place in Italy this year. For this purpose, we held a preliminary meeting last December (Ref.1, 2). Next day, the 13th, the meeting started at last. Venue is within this gorgeous hotel. The opening was "Welcome Speech" by Professor Petroni of Aspen Institute Italia, the joint organizer, and myself. In the end of my speech, I mentioned that the Global Fund was founded through the active work of Japan and Italy at 2000, 2001 Summit, and that the host of 2001 Genoa Summit was current Prime Minister Berlusconi . Participants were seated in circle around television screens for discussion. I will show you more photos once they are ready. 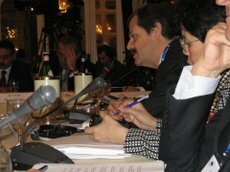 Photo4: Mr. Massolo, the Sherpa and Dr. Chan of WHO. Photo6: From right, Minister of Health, Dr. Hatem El Gabaly, WHO Executive Director, Global Health Workforce Alliance Dr. Sheikh, Executive Secretary of GAVI Alliance Dr. Julian Lob-Levyt, ActionAid International delegate Dr. Noerine Kaleeba(Dr. Kaleeba is from Uganda). 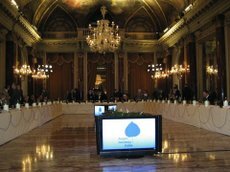 Many important people such as WHO Director General Dr. Margaret Chan, Aspen Institute Italia President and current Minister of Finance, Dr. Tremonti, Sherpa of Summit in Italy, Dr. Massolo gathered for this meeting. Mr. Keizo Takemi was also present. As we were acquainted with each other through participation in Toyako Summit, I informed him about the outcomes we’ve achieved so far. The members of this meeting were just outstanding. Everyone participated actively in enthusiastic discussions. At a time of such economic disaster, wouldn’t it be great if we could contribute to this year’s G8 Summit in Italy, however small the contribution is? It would also be good for the presence of Japan in global society. 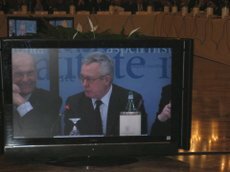 On this very same day, our article “Italian G8 Summit: a critical juncture for global health” was published in The Lancet, February 14th, 2009; volume 373, number 9663,　p.526-7. We wrote this mainly from “Japan’s experience on Global Health”. Most contents of The Lancet are free for access On-line for any users with registration. I strongly recommend you to register. Here, I will provide links to the On-line version and PDF for your reference. G7 Finance Ministers' meeting will start from tomorrow in Rome so tonight there will be a reception, I hear. 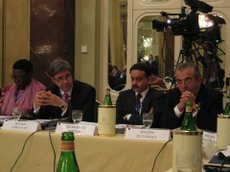 Next week H8 meeting for discussion on health issues among G8 relations will take place as well as G8 Sherpa meeting. Naturally, people involved are moving very busily. In the evening, Dr. Peter Singer (Univ. Toronto) (Ref.1, 2) , Dr. Rajeev Venkayya of Gates Foundation, Mr. Banno and I went to a nice restaurant well known around here. Photo7: From right、Myself, Dr. Peter Singer(Univ. Toronto) , Dr. Rajeev Venkayya at Gates Foundation, Mr. Banno. 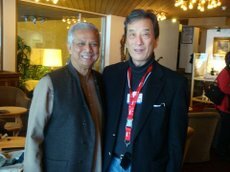 Dr. Vankayya said he had seen me more than a decade ago when I was Professor of Medicine at Todai. I started Chief Resident Exchange Program with University of Michigan then, and he was one of the visitors to Todai under this Program. What a coincidence! I arrived at New Delhi from Davos via Munchen early in the morning of February 2nd. This is my 3rd visit during this past 12 months. Many of you might feel that India is difficult to understand or mysterious. Let me introduce you an interesting blog (in Japanese only). It is quite fun with lots of humor. 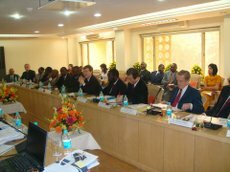 Now, like last summer, I am here this time as a team member of Jeffery Sachs to participate in the meeting of international advisory council organized by the Minister of Health and Welfare of India which is held twice a year (I did not attend last February) (Ref. 1, 2). Main topic is "Rural Health". Right after checking in at the Taj Mahal Hotel were briefings from Indian researchers and people from NGOs on current status, analysis, issues, etc. followed by discussions. After a short break in the afternoon was a reception. Next morning, we worked for about five hours straight (even lunch was during the meeting) listening to the reports by government officials, discussing, exchanging views. Same as last time, the Minister had very clear understandings on almost all issues and was able to further explain or join in the discussions. He is a specialist of this field ? Rural health (medicine). He has an excellent understanding of the situation. I could clearly see even from the data that the project has developed remarkably (though yet much more to go) within this one year. It is truly amazing. Photo1: The advisory meeting. Indian side in front row, fifth person from left is Minister Rmadoss. 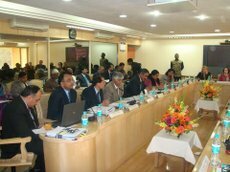 Photo2: Likewise, the advisory meeting committee side. From right, Prime Minister Dr Tore Godal of Norway, myself, Health Minister of Kenya, Dr. Sachs, Health Minister of Malawi, Health Minister of Rwanda etc. Although background of the situation in India may be different and there could be many parts where even India might be better in comparison, Ministers of Health and Welfare from Kenya (Professor Peter Anyang’ Nyong’o, Minister of Medical Services), Rwanda (Dr Richard Sezibera), and Malawi (Minister Khumbo Kachali) also came to join in the meeting in hope to find some issues or references that apply also to Africa. The content of the meeting was very useful for them, so it seemed, that here again we succeeded in having active and constructive discussions. I left the hotel in late afternoon for airport to return to Narita. 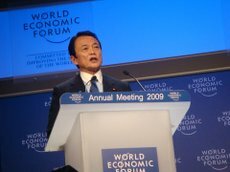 Prime Minister Aso then had several interviews and lunch. 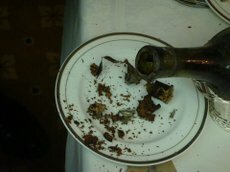 I was invited to the lunch also. Here again, he exchanged views with many leaders of the world through active questions and answers. To have lively conversation is very important. 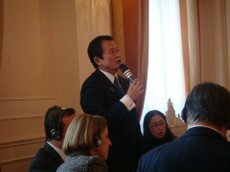 Photo2~3: Prime Minister Aso at speech and lunch meeting. 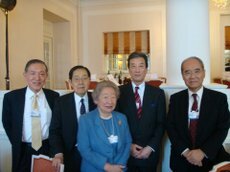 Photo4: At the lunch, Chairman and CEO Hayashi of JETRO, Dr. Ogata and her husband, Director General Matsuura of UNESCO. Surprisingly, "UNIQLO" sponsored the lunch that gained good evaluation. The room was decorated with cool displays and many beautiful screens (see photo at the top). I heard that the lunch boxes they served were also appreciated for its tastiness. In short, the presence of Japan this day around noon was outstanding. Good work, everyone! 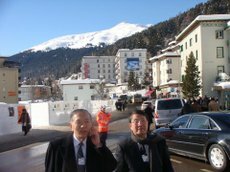 It seems that Mr. Saito, Minister of Environment, accompanied the Prime Minister. He chatted with Professor Daniel Esty of Yale, who happens to be my friend also. Photo5: With Minister Sato and Professor Esty. 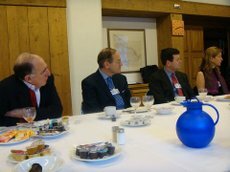 On February 1st, the final day of Davos meeting, I participated in Global Agenda Council. The last session was with Archbishop Tutu of South Africa （known for oppositions to Apartheit and following commitment to human rights issues, etc. He was awarded Nobel peace prize for 1984）, having dialogues with young people. As cleric and activist of human rights, his communication skill is high and the session was extremely interesting. Photo6: Archbishop Tutu in dialogue with the young people. 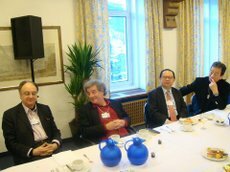 The details are available in the summary PDF of this year’s Davos meeting which symbolized the age of turning point of the world. Several photos are also posted on web. I happened to come across with Mr. Yunus at the lobby as I was checking out (Mr. Yunus is Nobel peace award laureate. I have been introducing him in my speech, blog, etc. constantly as good example of social entrepreneur which is a strong trend in this global era.) . He is founder of Grameen Bank that contributed to the financial independence of women in Bangladesh through Microfinance. It was a good opportunity to inform him about our motivated young people in Japan. He will be visiting Japan in March again. We said good-bys hoping to see each other if our schedule meets. It would be great if the meeting actually take place. After talking with Mr.Yunus, I left the hotel for Zurich Airport to take flight to New Delhi. A new session of "IdeasLab with・・・" started this year, so I adjusted my schedule to create time to join in this session with Yale University. 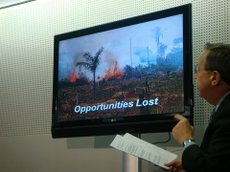 Four professors presented summary of issues, each for five minutes (Power Point could be used, so "visual" effect was important), after which followed group discussions on each theme so as to produce a number of conclusions. Very nice style. 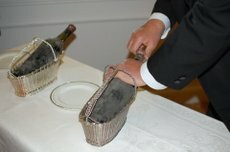 Davos meeting is creative in many ways. At the Yale session, presenters were two professors on economics, my friend Dr. Daniel Esty（a member of Obama’s transition team, specialist of environment）, and especially Dr. Robert Shiller’s presentation about the history of collapse of housing bubbles was extremely interesting. 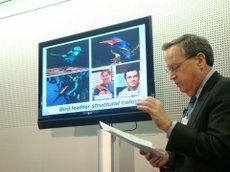 The last presenter was President Richard Levin who started with recent scientific topics in Yale. Everybody was good, but Dr. Levin was especially impressive in・・・so to say "performance." Indeed he is a cream of the crop. Photo2: From right, Professor EZ Ponce de Leon of Yale University raising an issue, Professor Richard Pascale of Oxford University acting as Facilitator, Professor Robert Shiller and Daniel Esty of Yale. 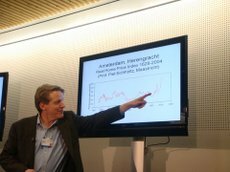 Photo3: Professor Shiller at presentation. 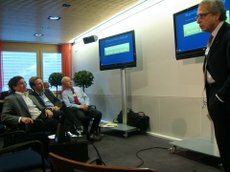 Among the discussions that followed, I mainly participated in the group of Dr. Levin, which was very interesting. Admitting the strength of American/European Universities and research careers that develop individual talents by systematically supporting constant competition away from home ground, the argument followed that this is exactly the point where Asia, especially Japan, is weak. All participants quickly agreed on this point, and I also repeatedly point this problem out on many occasions. Especially, at this timing when progress and global competitions are inevitable, one of our conclusions was to recognize the mission of higher education for developing talents and potentials of the younger generation. Photos4～5：　Presentation by President Levin. In the evening of 30th, I accepted invitation to seated dinner hosted by UBS where David Cameron, Leader of Conservative Party, gave speech. British politicians are extremely good at speeches. After dinner I left the place to participate in a meeting of Cambridge University starting from 10:30pm. It was a small gathering, but opening address by Vice-Chancellor Allison Richard(I have explained why the head of Cambridge University has this unusual title in my blog in 2006) was charming, starting with comment on the 800th anniversary Cambridge is celebrating this year. 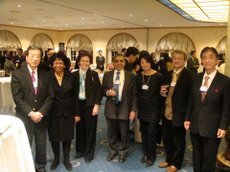 President Komiyama of Todai, President Susan Hockfield of MIT were also present. The meeting continued till late at night as we enjoyed conversation. Presidents Richard and Hockfield represent epoch-making changes in global age which I stress repeatedly in my blog. Both of them were Provost of Yale University before being recruited to the presidency of Cambridge and MIT respectively. Dr. Hockfield was successor to Dr. Richard at Yale, both personnel transfers having been managed by President Levin whom I touched upon earlier in this column(Dr. Levin told me personally several years ago that Provost is appointed by President.) . I am amazed by Dr. Levin’s outstanding insight. In any organization or institution- universities, companies, government offices, etc. -leaders must be likewise. After all, ultimately, the essence is education. It is all about bringing up talents. Weather is beautiful again today. 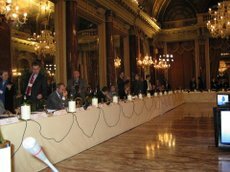 Meeting as a whole is on the web site – from varieties of sessions to reports. Enjoy them with ‘clicks’ when you have time. Participation of young Japanese people from industrial sector is increasing steadily and becoming notable. Their words and presence are positive and I am glad about that. Since people of the world thinks that industries of Japan are represented by "Keidanren," it would be even better if young people increased more to liven up the place and impress the presence of Japan. This year’s meeting has very different atmosphere from previous meetings because of market meltdown and the prospect of economy’s continuing downfall. People argue a lot about why finance relations are not punished for creating problems, when other industries will, as a matter of course, be given penalties should they put defective products into market. "Greed," "Loss of Style" may be the keywords. I heard much talk of this sort going on at personal levels. In the Gaza issues panel (see Webcast), the prime minister of Turkey stood up before the panel was over and left for home protesting that he was treated unfairly compared to President Perez of Isreal in terms of the allocation of time for speech, and the (bad) timing of speech. I haven’t seen that scene in person, but naturally it was a hot topic and judging from media reports, people in Turkey are paying much attention as seen in the frantic welcome at the homecoming of the prime minister. After watching the Webcast, what is your impression and opinion? Photos2~4: Breakfast meeting. You might know some of them. On 30th from 7:30am, I was invited to a breakfast meeting of "friends who worry that Japan is vague to the eyes of people in the world because it sends too little information," as they called it (Photos2~4). It is so moving. I think many of Japanese participants were told something like this, at least in private situation. 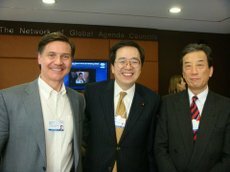 I also had opportunities to have lively discussions with various people, such as Mr. Okabe, Editor in Chief of Nikkei, Mr. Hayashi, Chairman and CEO of JETRO. Unfortunately, it is difficult to see each other in Japan because everybody is busy. As for myself, I had panels on Day 2 and Day 3. I fully enjoyed them, making lots of new friends at the same time. 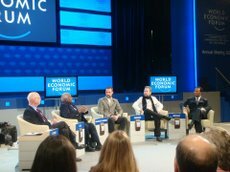 I think part of the panels may be viewed at the website of Davos Meeting (29th, 30th, and the final day). From media, Mr. Funabashi, editor in chief of Asahi Shinbun newspaper, Mr. Okabe of Nikkei newspaper, Mr. Fujisawa of NHK television, etc. were present. Ms. Waki (residing in London) from Reuter is also working actively as reporter every year recently. 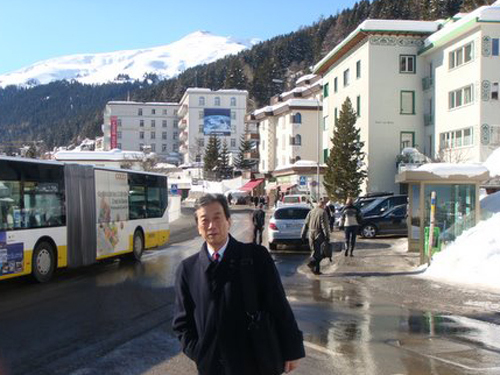 I came to Davos meeting again this year. Surprisingly, I have been participating in this meeting for nine consecutive years. This year, I have been asked to join three panels – very busy. Center of topics is of course the collapse of the financial market and serious depression of the economy. 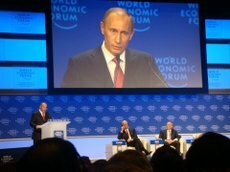 The first day’s highlight was the Opening Plenary by Putin of Russia. Seats were full by 30 minutes before it started. His message was aggressive from the beginning to the end. Putin must have given people impression that working with him would be tough. His strong attitude continued through even to the questions and answers session. Check it on the web site. Prior to Putin’s Plenary was a lecture by Premier Wen Jiabao of China. Lectures were great, but also they handled questions and answers with wits and tacts. It is an important factor in occasions like this. 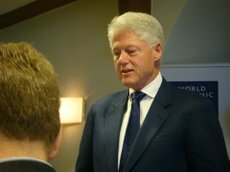 At the 2nd day breakfast meeting I was invited to, former President Clinton showed up and gave a speech for about 10 minutes. I happened to be seated at a table beside him, so he shook my hands – to my delight. 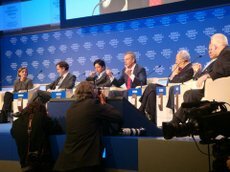 Plenary of the morning ended with Tony Blair, Ms. Nooyi of Pepsi (who graduated from IIT, a prestigious University in India. ref 1, 2 ), President Simon Perez of Israel, etc. Very impressive. I spent four hours of that afternoon with the board members of chemical industries, attending as Advisors with people like Dr. David King, Science Advisor to Prime Minister of England until 2007. Other attendants from Japan were Mr. Yonekura, President of Sumitomo Chemical, and Mr. Kobayashi, President of Mitsubishi Chemical Corporation. 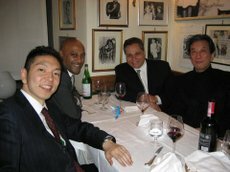 Photo6: From right, President Anzai of Keio U., Professor Ito of U. of Tokyo, Professor Mori of Harvard, Dr. Mahbubani, Dean of National University of Lee Kuan Yew School of Public Policy and his wife, President Dr. Simmons of Brown U., and myself. The evening event was "Japan Night" hosted by U. of Tokyo and Keio U., same as last year. I had an opportunity to see two female presidents, as President Allison Richard of Cambridge U. and President Ruth Simmons of Brown U.. 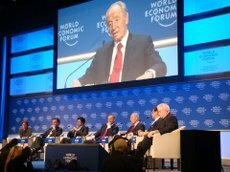 I am wondering whether it is time for me to be excused from Davos. I would like to see more new people, young leaders participating from Japan also.